I’d like to take something back that I said a few weeks ago on this blog. I know-shocking isn’t it? 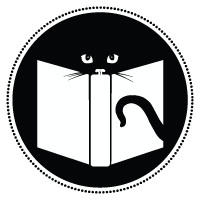 I don’t believe Alan Bradley’s Flavia de Luce Mysteries are a good example of a ‘cozy mystery’. They’re also no Jo Nesbo thriller, but I don’t think they quite fit into the cozy mystery definition. Nonetheless, I am a HUGE fan of this series, and I guarantee that anyone who enjoys reading the mystery genre (and all of its sub-genres) will like these books. In fact, I’m surprised I’ve had this blog for this long (about 8ish months) and have never had the pleasure of reviewing an Alan Bradley book for my readers. Well-the day has finally come! Time to dig in. 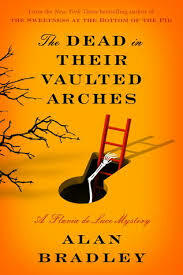 The Dead in their Vaulted Arches is the sixth title in the Flavia series, and just like the others, it was a true pleasure to read. What makes these books so popular and so good is the protagonist Flavia de Luce. She is the very definition of precocious, but her inner thoughts and turmoil are so adult-like that she can appeal to people of all ages. She is incredibly smart, resents her older sisters and has a charming vocabulary that makes me smile to myself as I read her books. She solves the mysteries as they occur, typically using the power of chemistry and undying curiosity to do this. In general, she has saucy responses to people that get in her way, but can prove unbeatably loyal when necessary. And as I’ve said before on this blog, a strong detective is what makes or breaks a mystery series, and she is the perfect example of this. 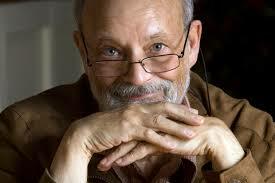 The more books of his that I read, the more respect I gain for Alan Bradley as a writer. At first glance, these books do seem very simple, but as you read further, a darker, more complicated back story begins to emerge, and each book seems to further develop this story that weaves in and out of the main plot lines. The fifth book ended on a whopping cliffhanger, which I must admit I totally forgot about until I picked up this sixth book almost a year later. As I said earlier, the further along I get in this series, the more I realize that these aren’t your typical cozy mysteries. Not all the victims in these books ‘have it coming’, and some pretty gruesome things happen that are described to the reader in great detail. Not a lot of gore, but more than your typical Murder She Wrote episode, so I think stripping the label of ‘cozy mystery’ from this series is appropriate. However, I hope that by analyzing these books more closely, I will encourage rather than frighten off perspective readers because I really do think Flavia deserves as many fans as possible.